My name is Fuller Grissom. If you seek a truly special vacation in a magnificent home, not a typical rental house, then you will find 'Bear Lodge' to be your place. If you value personal attention, you found it here! Please read our REVIEWS. We care what our guest experience while in our home and do our best to make your vacation the best ever. 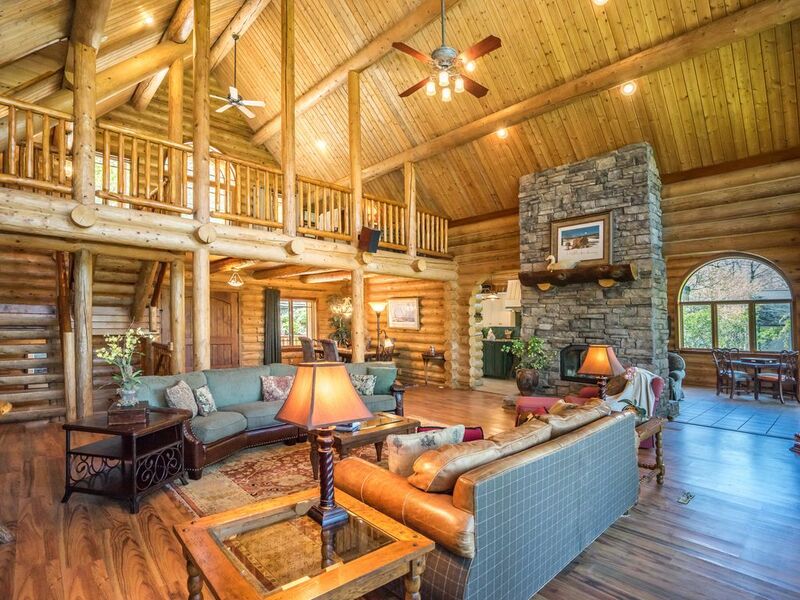 A magnificent 4500+ square foot NON SMOKING, custom home built true LOG HOME built from 'massive logs from Western Canada' and features a lovely view of Grandfather Mountain. Nothing but the best throughout, including the latest Wi-Fi available to all renters. Bear Lodge was built in 2000 and is simply the best in a great location with a gorgeous western view of Grandfather Mountain and nearby areas. Only 4 miles from downtown Blowing Rock, 15 miles to Boone, less than one mile from the famous Westglow Spa, two miles from the Blue Ridge Parkway, a short 5 mile drive to wonderful Appalachian Ski Mountain, approximately thirty minutes to Sugar Mountain and another 15 minutes to Beech Mountain, and located in well-known Misty Mountain on Hwy 221 towards Grandfather Mountain and only 4 miles from downtown Blowing Rock. The huge great room features a soaring 27' tall ceiling with 65' TV and wood burning fireplace. The fully equipped large kitchen has commercial grade stainless steel appliances. The large Master Bedroom is special and the Master Bath has a magnificent 84' x 69' Jacuzzi tub plus a walk in shower. Additionally, the spacious vaulted loft has two TWIN beds that shares the loft bathroom with the other upper level twin beds room. In cooler months, you will love the warm floors provided by in-floor radiant heat. Outside, you will enjoy over 1200 square feet of deck space suitable for al fresco dining or a grand cocktail party, plus a wonderful view of Grandfather Mountain from the rear of the house, which includes a 72' wide full width deck on the main level and a smaller deck on the terrace level. Children will love the upstairs loft plus the terrace level den as well as the extra large front and rear decks. We are Fuller and Sassie Grissom, live in the Wilmington, NC area when not here in our Blowing Rock Home known as Bear Lodge, and sincerely thank you for visiting our home. We take great pride in helping you to thoroughly enjoying your visit to our home. We designed and built our home beginning in 1999. The house features extra large round logs from western Canada and is upscale throughout. Please read what others say and we hope you will come and experience your vacation in our majestic home. We think if you come visit once, you will return often and we will make ever effort to assure you of a grand vacation. Simply the best!!! Located on superb Misty Mountain only 4 easy miles from Main Street Blowing Rock just off of Hwy 221. Only 5 miles to Appalachian Ski Mountain. In-floor radiant heat throughout our home, 4500 square feet of beautifully appointed space, 60" SMART TV that will accomodate your Netflix, etc., and wood burning fireplace in the Great Room. 72' wide rear deck facing Grandfather Mountain, Master Bedroom and Master Bath are spacious and has a 'huge' two-person Jacuzzi. Our kitchen features all commercial grade appliances and a chef's dream. Our driveway connects the road above our home to the road below our home for easy access year round, especially during inclement weather. We enjoyed our stay in this lovely mountain home. The accommodations were terrific and the views breathtaking! The location is perfect for food, shopping, hiking or site seeing on the parkway. We will stay here in the future. We had a wonderful visit. The home is in pristine condition. The views are breathtaking. If you are looking for the perfect log home close to town, look no further. The owners are very hands on if you need anything at all. They are extremely accommodating and available to handle all of your questions and concerns. We would definitely stay again if our travels brought us back to Blowing Rock. Anne, it’s been so nice meeting you and your family, and we appreciate your kind words. Overachieving is difficult but that’s our goal as renters. Take care and come back to see Bear Lodge again soon. Exactly what we needed for a long weekend! Proximity to both Blowing Rock and Boone was key for us. The house is a stunner, the whole family loved it! When Misty Mountain lived up to its name, we called it an early day with the fire place and the great room, roomy and very cozy. The ping pong table has seen better days but still functional, and was perfect for some family competition. The hosts were super attentive before our stay to make sure we had what we needed, and the cleaning/maintenance team had the place in tip top shape. Thank you for letter us stay in your wonderful home. Bear Lodge is the perfect place to spend a frigid mountain winter weekend. Temps were in the teens and winds seemed hurricane force but we were nice and cozy inside this beautiful spacious home. Very convenient into town and to the ski slopes. Thank you for sharing your home! Absolutely stunning home. Beds were extremely comfy, plenty of space for large groups, owner was extremely helpful. Would definitely stay here again! Thanks for the nice Review, Kendra. So nice to have you enjoy Bear Lodge. Come back soon. Loved the open floor plan with the huge great room and large kitchen plus the central location. I would recommend this unit for family retreats. We had two daughters, two sons in law, and four grandchildren plus my wife and me. Everyone enjoyed the long weekend.